Star Walk is a winner of APPLE DESIGN AWARDS 2010 for technical excellence, innovation, superior technology adoption, high performance, and outstanding design! Star Walk is installed for demonstration on iPads at Apple Stores! Try it out in the shops! Enjoy NEW Picture of the Day and Bookmarks sections, share your astronomy observations via Facebook and Twitter! iPhone best astronomy app *Featured by Apple – Best Apps of 2009! * is now available for iPad! On a bigger screen starry night sky looks fantastic with 3D graphics and one of the user-friendliest interfaces ever. 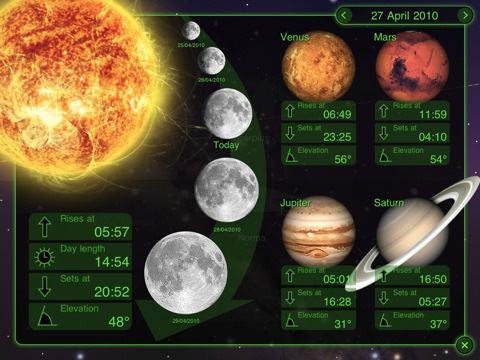 Star Walk is your personal planetarium that can answer to all your curiosities about the sky! For anyone who is interested in stargazing, amateurs or professionals Star Walk makes discovering more than 9,000 stars, planets, constellations, messiers as beautiful and easy as it has never been before! DIGITAL COMPASS: tilt your iPad and the ”Star Spotter” function will be activated, a live representation of what you see in the sky will appear on your display and the sky will start following your movements right, left, up, and down. 1) Tilt your device from landscape to portrait orientation several times. This will help the digital compass recalibrate itself and calculate current position. 2) Make sure the compass is not obstructed by thick walls of buildings or large amounts of metal nearby. Try going outside. 3) Consider trying again later. Sometimes it is unclear what may be influencing the magnetometer. TIME MACHINE: tap the clock icon and scroll the time slider to watch the sky tonight or lets say two years from now. Travel in time and observe night sky on your birthday, be a part of astronomical events like Solar eclipses and meteor showers. SKY LIVE Window: open up the new window by tapping the moon-shaped button to see moon phases, elevation, and rising data for the Sun, Venus, Mercury, Jupiter, and Saturn. PICTURE of the DAY: Tap the right hand corner menu button, select glowing “Picture of the Day” button and a list of pictures will open in front of you. To learn more about the pictures tap the -i- icon on the top right hand corner. BOOKMARKS: save a reminder of beautiful night sky observations, bookmark it on your iPad and view it at any time. VIEW from the EARTH: Automatic and manual selection of locations on a 3D globe. MOON PHASES: select the SKY LIVE window and see the moon phases for several days. Change the date on the top to see the moon phases for the past or for the future. Or zoom in the image of Moon and scroll the time slider. Wikipedia LINKS: select one celestial body and tap the – i – icon to activate the magnifier and read main information about it. To know more tap the Wiki icon at the bottom of the table and the Wikipedia page will open up. SEARCH celestial objects: you can also search for stars, planets, and messier objects by their names and see where they are on the sky tonight and when they are going to be visible in your region. SETTINGS: with the settings you can modify user preferences like you can change the screen to night mode, select brightness of the stars (change stars magnitude with a slider), put sounds and music on or off, switch on or off the constellations images. HELP GUIDE: the help tab includes some basic instruction on how to use time machine and location selection. FAQ section includes some common questions from our users and answers to them. For any doubts, suggestions or concerns contact us via support e-mail, Twitter or Facebook fan page.